Marion County Sheriff’s Department officials weighed in this Mexican Ice at 19 ounces after it was seized from a Marion County residence near Hodges on Jan. 6. Five people were arrested in a major drug bust at a Marion County residence near Hodges, with federal authorities now joining an investigation that has been conducted by law enforcement officers in Marion and Franklin counties. Marion County Sheriff Kevin Williams said on Tuesday, Jan. 10, that the five were arrested on Friday night, Jan. 6. • Joshua Clint McCarley, 34, 325 Hodges Lake Road. • Rietta Renee McCarley, 54, 325 Hodges Lake Road, who is Joshua Clint McCarley’s mother. • Lindsay Michelle Lowe, 29, Russellville. • James Rocky West, 27, 739 Old Lime Road, Hodges. • Eric Brandon Holland, 35, Hamilton. All were charged with drug trafficking, with bond set at $1.5 million each. “(District Judge Mark) Hammitte set the bond as high on drug trafficking as he could,” Williams said. All were taken to the Marion County Jail in Hamilton, where all were still being held as of Tuesday, Jan. 10. The search warrant, which was obtained late in the afternoon on Jan. 6, was issued for the McCarley residence, he said. It was executed about 8:30 p.m. and authorities stayed until about midnight. All five individuals were inside the residence and did not put up any resistance, he said. 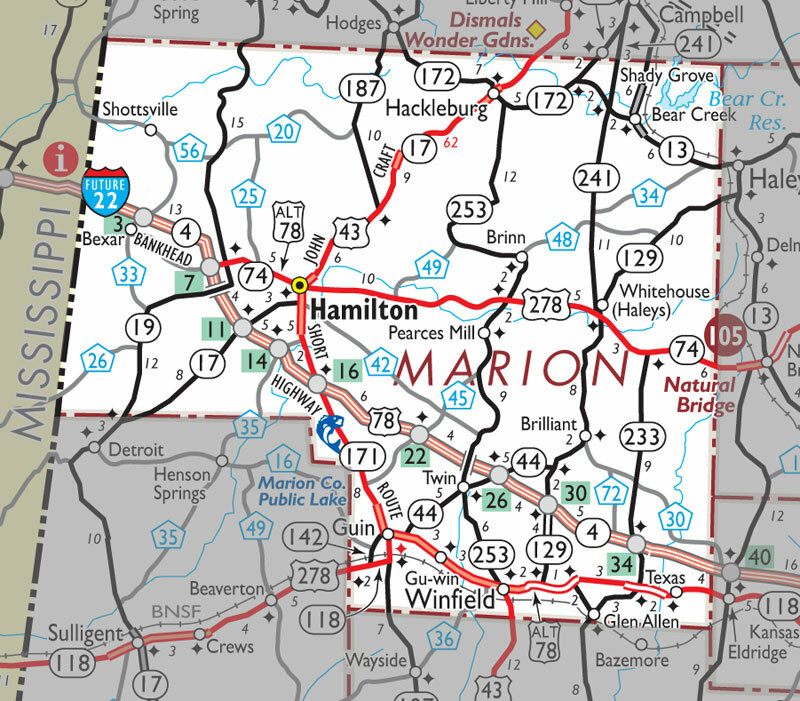 The Marion County Tactical Team and the Hamilton Police Department were called to help as they suspected several people were in the residence, as well as a large amount of drugs and a large sum of money, Williams said. Authorities also suspected weapons would be on the scene. A total of 19 ounces of methamphetamine was confiscated in the form of high-quality Mexican Ice, which is crystallized, he said. “The average street value is $1,000 an ounce,” he said. Also, about $8,000 in cash was seized, as well as drug scales, drug paraphernalia and one firearm, a Browning .300 short magnum rifle, Williams said. Williams said, “This has been a joint operation between the Marion County Sheriff’s Office and the Franklin County Sheriff’s Office. (Both offices) have been receiving quite a bit of information between the two offices for about several months. An ongoing investigation in the case is continuing, with hopes to possibly have more arrests later, Williams said. Besides the drug investigators from the two local sheriff departments, Williams said federal authorities are involved, although he could not provide further details. Williams said Franklin County Sheriff Shannon Oliver is a good friend and that the investigators between the two departments work well with each other. Oliver told the Franklin County Times in Russellville that the Franklin County Drug Task Force, including officers from the Franklin County Sheriff’s Office and the Russellville Police Department, also participated. “We followed through with information that led to that arrest,” Oliver told the Times. He said cooperation among the agencies was crucial in this arrest, and that it helps with they can all work together.